Just a trio of Easter Eggs to stitch and adorn your baskets of eggs! Each egg measures somewhere around 2-1/2 x 3-1/2 -- they are all slightly different. 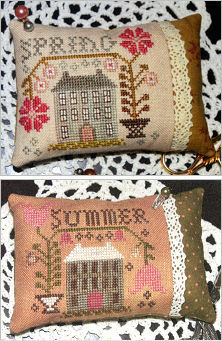 Stitched with Sampler Threads or DMC, Lady Dot's Baby Ball Fringe Trim in Vintage and Rainy are featured. 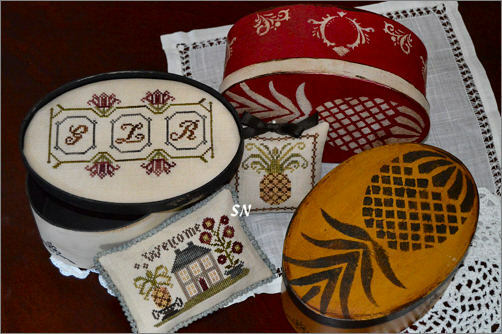 Abby Rose has made some hand-painted and waxed paper mache boxes that she has stenciled with a pineapple design. Then, she has designed an initial panel to line the box lid, and two pin cushions for the inside. 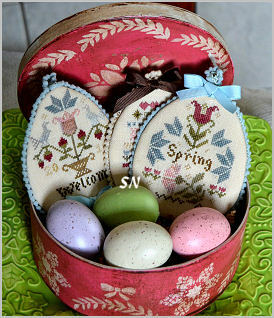 Measuring 5 x 8 -- oval -- by 3 inches high, each box is lovely! Choose from Antiqued Brick Red, Mustard or White. Presented as the box with calico backing fabric and trims for the cushions, the charts and alphabet for personalization are also included. Choose a smattering of DMC or Gentle Art Sampler Threads from your stash. 1/4 yard of 32ct Lambswool linen is recommended to make all your pieces. Very limited in production, Gayle finished the boxes herself... and has sold out her release! Here are two new charts that make into small 4 x 6 and 5 x 7 designs. 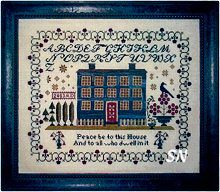 Stitched with a mixture of brands of hand-dyed flosses, the houses will take a little longer to work up than the Blessings Penny rug piece. Actually, the houses -- which are all about 30 x 40 each -- would make awesome individual cushions! Toss them in a basket with the sunflowers and trees constructed into their OWN set of cushions -- you could make 6 smalls out of this! Just fun, simple charts! This is a trio of 80 x 90-sized designs celebrating Christmas carols. 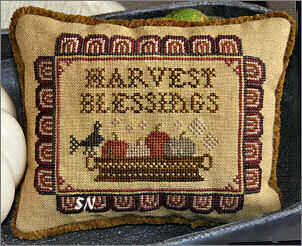 If you stitch them on the suggested 30ct Weeks Cocoa Linen, they'll finish almost 5 x 6. That fabric comes up to 40ct... so you can go smaller if you'd rather, to make a basket of three cushions. Weeks and Gentle Art hand-dyed flosses, add some pretty chenille trim to all three -- use the same color for all of them, or a different shade for each. Let us know your fabric and trim thoughts! *Happy is the woman who can find constant resources in her own mind. * I LOVE that verse! With a stitch count of 109 square, this finishes a generous 8 x 8 on 14/28, but can be BITTY if you do it over one on 36 or 40 (like 3 inches total!) Pretty border and a cute little garden cart, this is stitched with 14 shades of hand-dyeds and a bit of DMC black for the tiny bird. 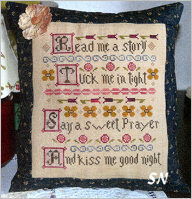 *Read me a story, tuck me in tight, say a sweet prayer and kiss me goodnight. * Do you know a special little someone who would love this hanging on their bedroom wall... or near their bed at YOUR house??? 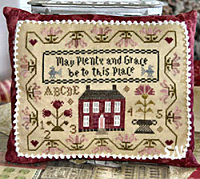 Abby Rose has released this new chart -- the design finishes approx 6-1/2 x 7 on 32ct. It is coded for either DMC or hand-dyed cottons. Pretty colors, you can change them to match your room... frame it, pillow it, even re-arrange the rows a little and make it long and skinny -- in case you want to bolster-shaped pillow for the bed! It's a sweet design! 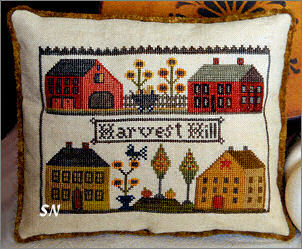 Autumnal colors for the little house and it's garden vine... this chart stitches into a 4 x 5-1/2 inch cushion. You could leave off the *autumn* and add a couple more blooms to the upper vine, just a quiet bitty piece! 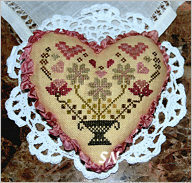 Coded for DMC or hand-dyeds, it is worked on neutral colored fabric. Abby Rose presents four new pin cushion-sized designs... To Thine Ownself... Be True is just one. (The other three are described on our interior AR page) Offered as a chart, it is worked on 30ct (but can be anything you want!) in soft pinks, greens and browns of Gentle Art Sampler Threads. 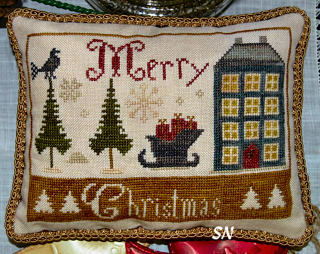 Not big, not a series, not representing a season, this is simply a lovely little design! Want some chenille or hand-dyed silk trim for it? We have lots to choose from and can do that for you! What a pretty little piece, this is worked on natural linen (it comes in 28, 32, 36 and 40 so you have options!) 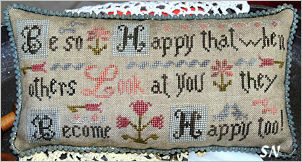 with Gentle Art Sampler Threads from your stash. Along with the chart, you get a pretty pearl/crystal decorative pin for your finished cushion, the blue and coffee colored finishing fabric and a super-dusty-deep-blue-grey hand-dyed rayon ribbon for the edging trim. It looks like a medium bright blue in the pic, it is NOT! It is dyed to match GAST's Aged Pewter. 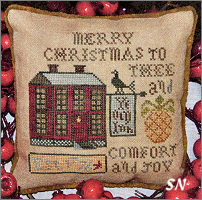 The stitching measures approx 4 x 4. 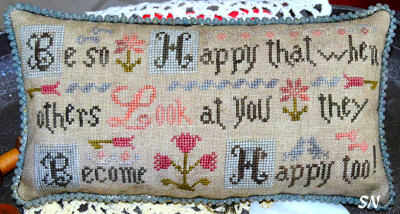 Another cushiony thing with a verse on it -- like *Do More of What Makes You Happy*... this is kind of cool. 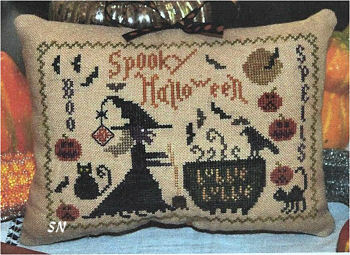 Stitch it and tuck it into that growing basket of finished smooshy cushions. You know, the big bowl sitting on your kitchen island that bored hands dig through while they're sitting there chatting with you. 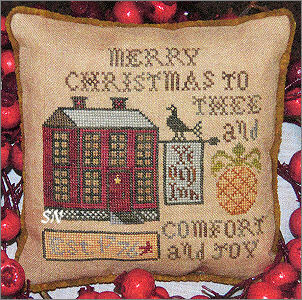 (They get to discover this charming collection of misc stitched cushions, all different, all fun... and then they finally get the fact that you STITCH, and they comment about it!!) See... this makes *them* happy, too!!! Another *Bowl Filler* for Christmastime! 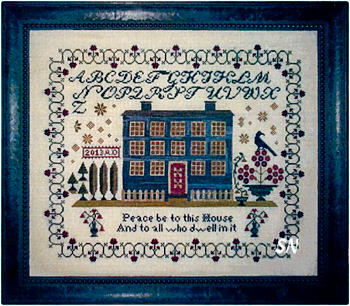 Finishing approx 5 x 7 on 30ct, hand-dyed flosses, stitch MERRY, but leave off Christmas, and put your family name there instead! Then, tuck it into that awesome basket or bowl! 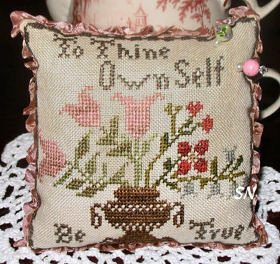 A cute little pin cushion design... this is stitched with nine different shades of hand-dyed cottons and finishes about 6 x 6 on 32ct Lambswool linen. 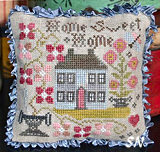 Nothing earth-shattering stitches-wise or embellishment-wise... just a REALLY sweet and lovely design! Presented as a chart by Abby Rose Designs. A sweet Halloween piece -- if one can call Halloween *sweet! * -- this makes a 4-1/2 x 6-1/2 cushion over two on 32ct. 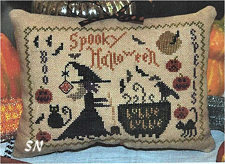 Stitched with hand-dyed flosses which you probably already have in your stash, it has the scary witch, the bubbling brew and all the necessary cats, bats, jacks, and the midnight moon. Just a cute seasonal decoration to stitch in a jiff! Presented as the chart. 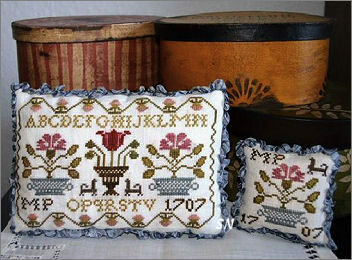 Charts by Abby Rose, a pair of pin cushion designs stitched on 32ct linen with a smattering of hand-dyed flosses. Instead of stitching the season... what about your house numbers from residences past?? Might be kind of a fun way to remember your old houses!! Each finishes approx 4 x 5-1/2. Maybe old buttons for some of the flowers, a little chenille trim that matches your threads?? 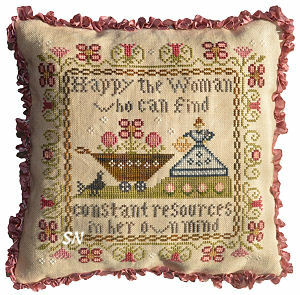 Just a sweet design, the larger cushion pictured measures 115 x 80 stitches -- so 5 x 7 on 32ct Antique White Linen. The smaller version is just 3-1/2 inches. Motifs taken from an antique sampler, this is worked with Red Pear, Pecan Pie, Oscar, Olive and Dolphin hand-dyeds. Simple and pretty to perch in that basket of pin cushions you're working on!!! This is a charming smaller urn piece -- just a simple design -- 73 x 63 in stitch count. 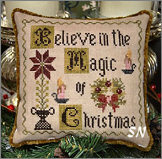 It is worked on 30 ct hand-dyed linen to finish approx 4 x 5 -- so smaller fabric will deliver a smaller finished cushion. It calls for Weeks and Gentle Arts of Charcoal, Faded Rose, Red Rocks, Tin Roof, Olive, Antique Rose and Bull Frog, and is coded for DMC as well. 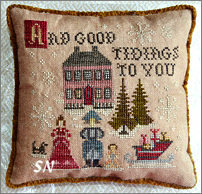 A super-traditional little sentiment to this piece, it would be so pretty in a guest bedroom or family room setting. Offered as a chart, it is stitched on 30ct linen -- anything neutral is good -- and calls for over-dyed or DMC flosses. Finishing approx 7 x 9, the model in the picture is finished into a pillow -- that's why I think it'd be pretty perched atop a guest bedroom bed. You can see a few letters and numbers scattered about -- change those to your family's initials and possibly some 'home established' dates. 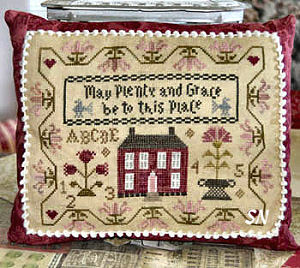 *Peace be to this house and to all who dwell in it. * A nice 'guest room' verse, inside an organized border with a very swirly alphabet... the garden is beautifully manicured, the stars in the sky are neat... and the house looks formidable! 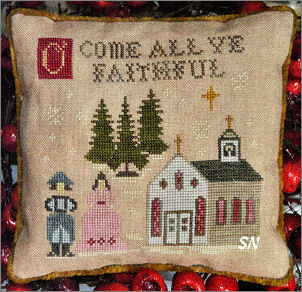 With a stitch count of 230 x 194, this finishes approx 15 x 13 on 30ct, the chart includes instructions for coffee-distressing your linen to give everything an aged look. Offered as a chart.